The ballpoint pen is the most popular promotional item on the market today. Millions of ballpoint pens, in a variety of colours (most popular being black, red, and blue), are sold throughout the world every year. How all of the materials that make up these pens come together in manufacturing is an in depth process. Going on China factory visits allow us to understand the different processes of promotional product manufacturing. A variety of raw materials are used for making the components of a ballpoint pen, including metals, plastics, and other chemicals. 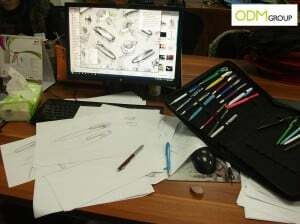 Plastics have become an important raw materials in ballpoint pen manufacturing process. They have the advantage of being easily formed, lightweight, and inexpensive. The basic pen manufacturing process includes ink compounding, molding, piece assembly, labeling, and packaging. The parts of the pen, such as the point and the body, are made using various molds. First, bands of brass are automatically inserted into stamping machine, which cut out thousands of small discs. If a full ball pen in being made, then the reservoir and ball point are inserted into the molded, and the rest of the component parts are assembled. The steel ram presses on the metal. The formed pieces are then cleaned and cut. The pen pieces are next polished. Once this is done, the pen is labeled. Promotional pen includes advertising pen, personalized pen, logo pen, and other business pens. They give you an opportunity to reach a wide audience for an initial investment. Logo on promotional pen is a tangible reminder of your company. Promotional pen is a perfect marketing tool for all businesses, from the start-up business to the large company.